Taking communion today, I flashed back to a conversation with a guard in a museum in Spoleto, in the center of Umbria, the green heart of Italy. It involved squirrels and happened like this. I was in a writing program and (not writing) went with friends to a museum there, probably the Museo Diocesiano. A large 16th C fresco portrayed the Last Supper. Forget a spartan meal of bread and wine. Here were heaping platters of fruits, dried and fresh, nuts, grapes, vegetables of all sorts. We talked a bit about Umbrian abundance but couldn’t help noticing that ceremoniously in front of Jesus was a platter of . . . roasted squirrel. No bushy tail, of course, but no mistaking the little pointed face and paws sticking up. Jesus is pointing to the roasted beastie with a gesture that clearly means more than “Yum, squirrel, my favorite. Thanks, guys.” Since I was the only one of the company who spoke Italian I was dispatched to find a guard and come back with the Word on Squirrel. With some difficulty I found a guard reading a newspaper, clearly not in the mood for art explication. With a long sigh, he put down his paper. Yes, he did know the fresco of the Last Supper on the second floor. Yes, there was a roasted squirrel set in front of Our Lord. Me: But, sir, why is that? There were no squirrels in Palestine. Guard: (sigh) No? 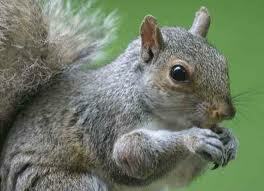 Well there were many squirrels in Umbria in the 16th Century. Me: Yes, also in my country and they are sometimes eaten, but Jesus is pointing to the squirrel in this fresco. Guard: Of course. (Looking at me as quite the dense of the dense, one who has no business in an art museum. Big sigh). Signora, you are perhaps aware that Our Lord is often represented as the Lamb of God? The guard snaps open his newspaper, explication done. I don’t move. Finally he looks over the paper at me. Puts it down. Really! These Americans, culture imbeciles. Guard: So would it not be disgusting to have a whole roasted lamb on the table, right in front of Our Lord? Guard: So . . . the artist used a squirrel. Now the guard is really finished with me. He opens the paper with clear finality and wishes me further enjoyment of the museum. Trekking back to my waiting friends, I laboriously put together the pieces of this little lesson. A roasted squirrel (sans tail) does (sort of) look like a roasted lamb, which reminds us of the Lamb of God. So there we have it, as any fool can see, the Blessed Squirrel that taketh away the sins of the world.